Transfering juveniles from a standalone BRT to one destined to run on a larviculture / early growout system. “Black Round Tubs”, or BRTs as they are commonly called, have become the new standard in marine fish larviculture, being seen in both commercial and hobbyist level applications (we occasionally see a variation on the BRT, the “Blue Round Tubs”, as well). The growing popularity of the BRT stems from a few key benefits that increase larval survival and facilitate the rearing of fish which may simply fail in a traditional glass, rectangular aquarium. The BRT’s first benefit is the color, opaque black, serving to block any side-lighting and being the least “attractive” coloration. Other coloration may distract or even attract larvae, reducing feeding success and ultimately larval survival. The shape of a BRT is the root of the other benefits. Being somewhat rounded where the side wall meets the floor, they eliminating corners that trap pelagic animals who have no clue how to deal with physical barriers. Additionally, their curved shapes and seams allow for myriad water circulation patterns to be created with the use of air or water current. Rotational patterns can be created both on the vertical and horizontal axis within a BRT. As Dr. Matthew L. Wittenrich once pointed out, being able to create gradients of current, and light, within a larviculture vessel, allows the larvae to find their own perfectly suited micro-habitat, the perfect combination of light and flow, within the rearing vessel at large. BRTs, when combined with a point light source, can excel in this task. The proof is in the results. Peering into a “BRT” full of near and post settlement Sunrise Dottybacks, Pseudochromis flavivertex. Larviculture systems for marine fish didn’t simply stop with rethinking the culture vessel; hobbyists, researchers and commercial breeders all play with “flow through” concepts as a methodology to “filter” what was historically “unfiltered” larval rearing water. Recirculating larviculture systems allow for the use of devises like protein skimmers, media reactors, and UV sterilizers to maintain water quality and reduce problematic waste and bacteria within the larviculture environment. 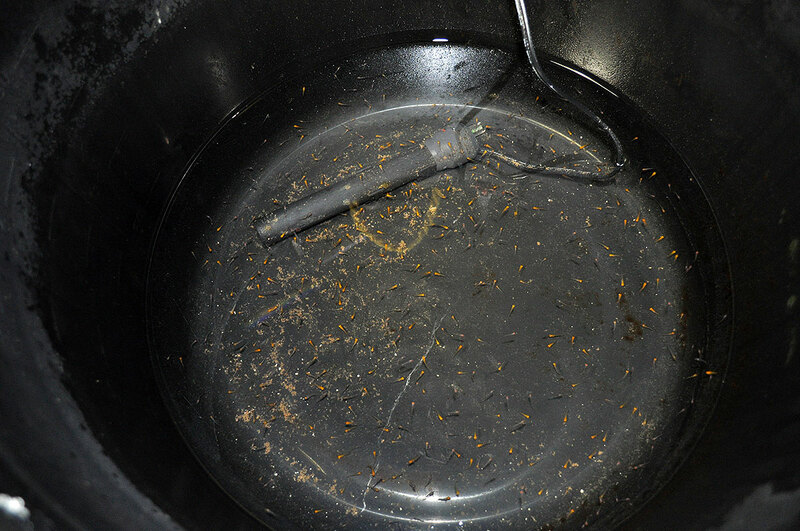 Of course, one of the largest challenges is how to keep the larvae, and possibly the food, in the rearing vessel, while still allowing the water to pass out. My go-to methodology has included simply placing drains in the path of an air feed, which keeps fish and particulates away from, and off of, drain screens. 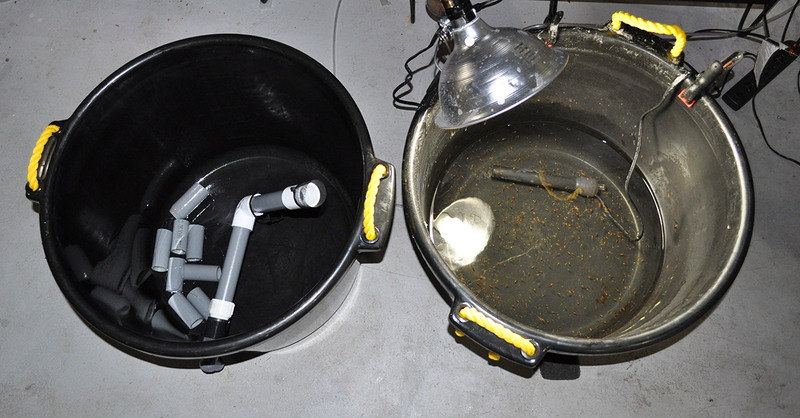 A recent conversation with aquarist Ryan Moses alerted me to another attempt at keeping larvae out of drain feeds, something demonstrated in a video by Orestis Papadakis. Matt Pedersen’s “black round tub” larviculture system shortly after setup in 2010. 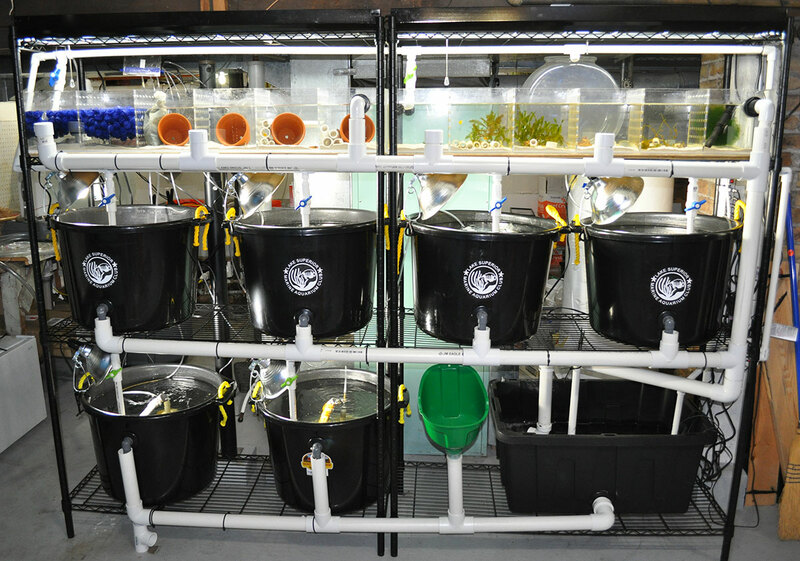 The system now includes expanded biological filtration, protein skimming, and a Two Little Fishies Media Reactor, bringing full blown filtration to tubs full of almost microscopic larval marine fish. Of course, the video Moses shared was so much more than simply a drain feed – it documents a well-executed attempt at designing a modern “BRT” larviculture system, designed by Papadakis while a student at the University of Aegean, Department of Marine Sciences, Greece, under the supervision of Florent Keller. The system, dubbed “The Copepode”, was “designed and built in order to host and raise the Pomacentridae family and other ornamental fish larvae as soon as they’re hatched, as well as to maintain their live [prey] ([nauplii] of copepods, rotifers, Artemia) and the algae (greenwater) in the main larval tanks.” With multiple redundancies and quality materials being used, Papadakis and Keller arguably spared no expense in the creation of this system for the Institution “Aquarium Des Lagons” in New Caledonia. It would be interesting to see how this system has fared when put into service; while Papadakis is no longer involved with the project, he reported that “as far as I am informed, the system is already in operation and serving research purposes with success on larval rearing”. The system was built for scientific research purposes in June 2013, in Noumea, New Caledonia (Pacific French Territory) and it is owned by the Institution “Aquarium Des Lagons”. The study, design and construction of this project was done by Orestis Papadakis and supervised by Florent Keller. 3D graphics, Video filming and editting: Orestis Papadakis | Greece, August 2013. Contact information for Papadakis can be found in the video’s closing credits.